1. "CHALET STAY". The classic chalet ski holiday - wifi - use of chalet computer - sauna - hot tub - just a few minutes walk to the Chamonix / Les Houches ski area - free use of buses and trains within Chamonix Valley connecting all the ski areas + optional private transfers to the various ski areas. 2. "SKIING SAFARI". This programme has been tremendously popular since its conception in 1991. From the comfort of the chalet you can discover some of the 20 amazing ski areas in the Mont Blanc region with daily transfers. 3: "SKI 3" - Zermatt, Chamonix & Megeve. Included transfer from Geneva Airport to Zermatt. Three days skiing and two days of ski leading in Zermatt. Transfer to Chamonix for 4 nights at the Chalet Savoy with daily pick up at the Chamonix slopes and one day excrusion to ski Megeve. 4. "SKI THE ALPS": Daily transfers to one of the ski areeas included on the local "Mont Blanc Unlimited" ski pass. 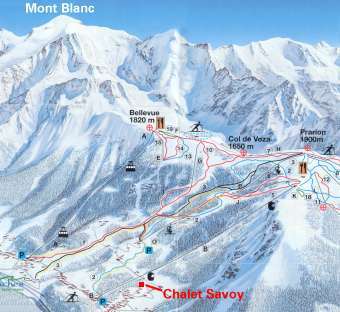 The Chalet Savoy is a perfect venue for your ski holiday. We like to think we are the ski chalet that puts the emphasis on the skiing. Our guests would rather ski all day than drink all night. If you are looking for a week of late nights and heavy drinking please do not book with us. 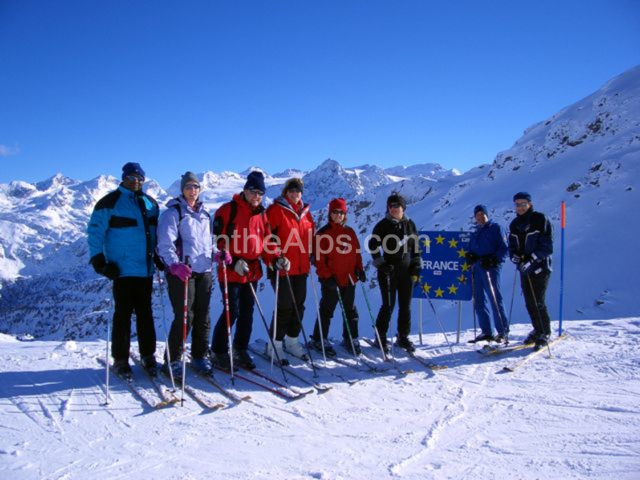 However if you want to get value for money on your skiing and enjoy a relaxed friendly atmosphere with people who love sport and nature, we are your place. It is an easy seven minute walk to and from the Les Houches ski runs (venue of Chamonix's world cup ski races). The Prarion ski lift is also only a seven minute walk from the chalet as is the bus stop from which you can access any of the Chamonix Valley ski areas with the excellent local bus service which you will have free use of. For a surchcare we can provide private minibus transfers to any resort in the valley. 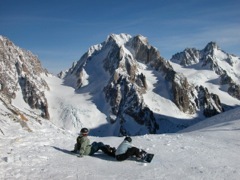 The Chamonix skiing is world famous. There is phenominal skiing for all standards. But the basic concept of skiing Chamonix can be complicated and confusing. Here are the basics in a nutshell. The Chamonix Valley is 24 kilometres long. The ski areas are not linked but spread along the valley. There are two separate village communes, firstly Les Houches on entering the valley and then Chamonix itself. After a period of not getting on very well the two areas now love each other and market themselves as Chamonix. But stupidly the basic entry price "Chamonix Valley" ski pass does not include Les Houches. I say stupidly ... not only is Les Houches a great ski area but it is a vital ski area for Chamonix when the weather is bad (i.e. snowy) Why? Becaus e all the other ski areas in the valley are above the tree line so when it is bad weather you cannot see anything and have a miserable day's skiing. Les Houches has loads of skiing on runs through the trees meaning in bad weather you can actually see where you are going. So Les Houches is great in any weather and the only place to ski in the valley in bad weather. Les Houches is also the venue of the Chamonix world cup down hill and slalom races. There is a cheaper lift pass just for Les Houches but this doesn't include the other Chamonix ski areas. Crazy lift pass set up? Yes. But don't worry, we'll sort it for you. AS OF WINTER 2015/16, THE LOCAL MONT BLANC LIFT PASS INCLUDES UNLIMITED SKIING IN THE EVASION MONT BLANC SKI AREA ACCESSED THROUGH MEGEVE AND ST. GERVAIS AND FEATURED IN OUR SKI THE ALPS PROGRAMME. 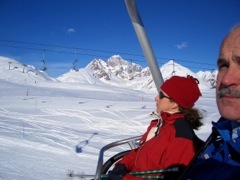 Take a ski holiday with us and we'll really look after you. On our "Chalet Ski holiday" we'll house you, feed you , advise you.You can easily walk to the Chamonnix / Les Houches slopes.. If you want to discover some of the 20 or so amazing ski areas an easy drive away click on Skiing Safari. i. For this you'll buy your lift passes on a daily basis and it will work out about the same price as the "Mont Blanc" lift pass. Beginners are advised to take group lessons in Les Houches and buy the local le Houches ski pass. The Chamonix- Les Houches ski slopes, venue for Chamonix's world cup ski races, are just a few minutes walk away. In normal conditions you can ski off piste right back to the chalet. There are 75 kilometres of ski runs suiting all standards including the renowned "Piste Verte" where Chamonix's world cup races are held. A brand new gondola lift will whisk you up to the local ski fields. : We recommend Battendier Sport. They are conveniently situated right by our local ski lift. You can book online at http://www.battendier-sports.com/en/ When you reserve online with Battendier Sport, they take your credit card detaiila but they don't charge you till the end of your stay. When they charge you it will be at the prices below minus 25%. from them. Alternatively you can ring or email the reservation or email us your equipment choices and we will hand them on to them. This year they are offering our guests 25% off their prices ie you will recieve a 25% reduction off the following prices. "A rosy faced joker called Oliver was one of the pleasantest ski companions south of the Artic". Arthur Sandles in the Financial Times. "Oliver is an excellent instructor" Tracey Savage, The Metropolitan.